We often hear chefs espousing their love for their ingredients: fine cheeses, truffles, pristine shellfish. The workhorses of the kitchen deserve some attention too, and Napa cabbage is definitely one I feel blushy about. It’s so soft, and cuts easily into fluffy mounds of ribbons that are perfect for soaking up dressing. I love dressing my Napa with Asian flavors like rice wine vinegar, sesame oil, fresh chilies, and lime. Napa cabbage is also extremely useful for rolling or stuffing because the leaves pull apart so easily. Other varieties of cabbage tend to break and splinter when you pull the leaves apart. Try steaming a few leaves for just a few seconds, just to make them pliable, and then filling them with sausage, rice, and plenty of fresh herbs. Roll away and bake with a simple tomato sauce, and dinner is served. Just makes sure you use a paring knife to cut away the thick, white ribs to make it easier to roll. The composition of Napa cabbage also makes it an ideal candidate for fermentation. Korean kimchi is an obvious choice, but you can make a paste of just about any aromatics and salt, shove and smear it in and around a whole head of Napa, and leave it to sit in the fridge for a few days. The result will be a flavor bomb that you can use to enhance any dish. Lastly, Napa cabbage is great as a filler. If you need to feed a crowd, consider adding ribbons of it to curries, stir fries, dumpling filling, and salads. It’s mellow in taste and even when cooked, it provides just the crunch you might be looking for. I put the quotation marks around the word “Chinese” because there isn’t anything overtly Chinese about this delicious classic. Moreso, it’s an Americanized amalgamation of Asian flavors paired perfectly with tons of fresh veggies, crunchy fried bits, cool chicken, and tons of herbs. The Napa cabbage serves as a base, and should be cut into very thin ribbons. That way it can easily soak up flavor, and you don’t spend your lunch hour chomping away! Season chicken with salt and pepper. Cook on grill pan for 3-5 minutes on each side on medium-high. While the chicken is cooking, heat the canola oil in a small sautee pan on medium heat. Add the shallots and allow them to cook until they get crispy. Set aside. In a small bowl, whisk soy sauce, ginger, sesame oil, hoisin sauce, chili sauce, sugar, salt, lime zest and juice, and vinegar. Cut chicken crosswise into bite sized chunks. In a large bowl, toss chicken, cabbage, carrots, scallions, cilantro, mint, half of the almonds, half the sesame seeds, half the oranges, and half the crispy shallots with enough dressing to coat lightly. Mound the salad on a large platter. Re-whisk dressing and drizzle a little over and around salad. Garnish with remaining ingredients and enjoy! Stephanie Goldfarb is a Chicago-based chef and national food television personality specializing in seasonal, globally-inspired cuisine. Recognized as the winner of Food Network’s America’s Best Cook competition, and a celebrity chef on Kitchen Inferno and NBC’s Food Fighters, Goldfarb delivers unique and relatable culinary experiences to discriminating and casual diners alike. 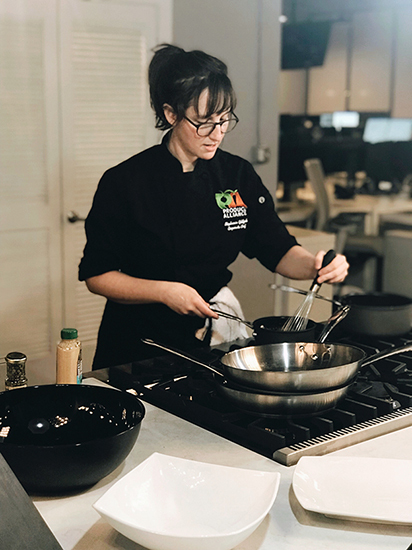 As the owner of the successful Seven Species Supper Club & Catering, she enjoys the challenge of building brand new menus each month that inspire both repeat clients and newcomers, and seeks opportunities to utilize new ingredients, techniques, and approaches in accessible ways.